If your elderly loved one has health challenges but wants to be able to live at home as long as possible, AIP Mobility Plus can help. We offer several accessibility products that help those with mobility or health issues get around their homes safely and easily. We also provide items that make it easier to complete everyday household and grooming tasks. When it comes to mobility equipment for disabled persons, AIP Mobility Plus provides no-slip bathtubs. These bathtub additions are added on conventional tubs of all shapes and sizes. Instead of climbing into the tub, the walk-in feature allows people to step into the bathtub without slipping or falling safely. It only takes a few hours to complete the installation process, and the door is airtight, so it is safe to take a full bath. There is even an ultra-model designed for deep bathtubs. AIP also provides shower accessories for the elderly such as grab bars. The grab bars make it easier to get into the shower and remain in the shower space while maintaining balance. Some elderly customers may also want to grab bars installed in the bathtub to position themselves in the tub safely. The bars can also be installed near the toilet to make it easier to stand up and sit down. Preventing slips and falls is a priority of AIP Mobility Plus, and we understand that features like grab bars can also make the bathroom safer for children or family members with health conditions that can make it difficult to maintain balance. AIP Mobility Plus offers several styles of ramps designed for people in wheelchairs or other electronic mobile devices. The slopes can also assist people who use canes to walk. These ramps belong at the front or back entrance of the home. 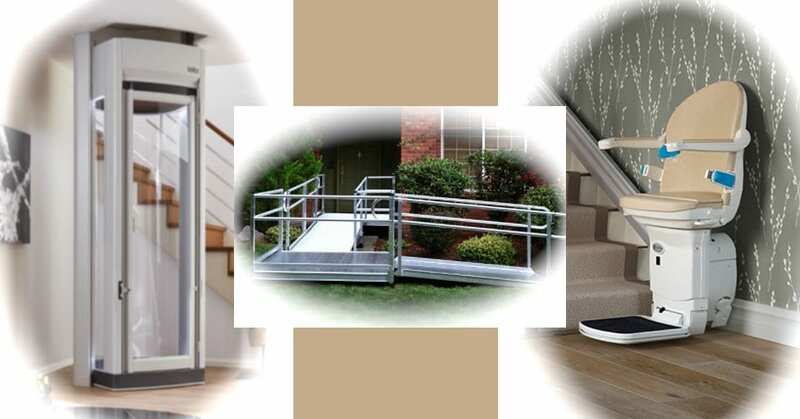 You can choose to have these ramps added to your property if you have your parents or grandparents over often. Alternatively, you can work with our consultants to add the ramps to your elderly loved one’s home so that he/she can continue living independently. We can also install ramps in various parts of the house so that your family member can move freely in his/her home. Having an elevator or stair lift in the home allows residents to avoid going up and down the stairs. Users can prevent pain in the legs and keep the muscles from straining or swelling. Individuals who are in wheelchairs can benefit from stair lifts and can get to all the floors in their homes quickly and safely. In addition to these helpful mobility products, AIP Mobility can also perform monthly maintenance checks on your home. We will inspect your house to ensure safety and to repair features that may not be functioning correctly. Our specialists can also recommend new products that will make your home safer. We can make modifications to your home based on your specific health needs and modify your entire bathroom so that you or your loved one can maintain independence. We know that regular health care can be expensive and that moving your parent or grandparent to an assisted living facility or nursing home can be very costly. With our mobility and accessibility products, you and your family can care for a relative while allowing him or her to continue living at home. We will offer solutions that fit a variety of budget and home models, so you are sure to find something that works for you. Browse our website to learn more about our products and services and feel free to contact us.